Modern Loss and Charred Oak Films hosted a screening of ‘The Widowers’ — a new comedy about grief. I read this article and found it very interesting, thought it might be something for you. The article is called Recap: Our Día de Los Muertos Event and is located at http://modernloss.com/widowers-dia-de-los-muertos-event/. 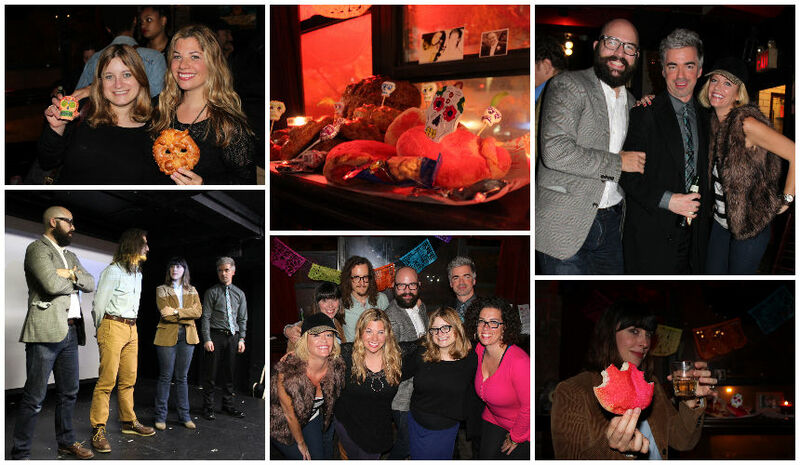 Scenes from our most recent screening and Dia de los Muertos-themed after party. On Wednesday night, some 50 members of New York City’s Modern Loss community headed to The Producer’s Club for a special screening of “The Widowers,” a new indie comedy about grief by the good folks at Charred Oak Films. The film, which was fully self- and crowd-funded by Charred Oak, has been making headway at recent film festivals around the country, winning Best Narrative Feature at this year’s Chain NYC Film Festival. It centers on two 30-something Brooklynites, Jake and Jonathan, who lose their wives in a car accident and deal with their (pretty complicated, it turns out) grief in different ways. Over the course of 100 minutes we accompany them to a grief counseling retreat for widowers in upstate New York. It’s led by the type of chipper people insistent on guiding guests down the “path to healing” and who most of us would want to decently slap — and who knows, maybe many of you have actually done that — if we were treated in such a relentlessly upbeat manner while in our deepest grief. Jake and Jonathan are joined at the retreat by several fellow mourners made to endure highly awkward group therapy, eat their feelings in the form of pancakes, and even attend a final “prom night” with the lovely ladies from the widows’ camp across the lake. Many of the widowers are caricatures of themselves — there’s the affable pothead, the gentle introvert, and the wealthy d-bag who smacks wonderfully of James Spader’s equally wealthy d-bag in “Pretty in Pink.” While we can’t recall actually meeting characters like this during our own grief process, the clash of this motley crew is highly entertaining and certainly contributes to the film’s comedy while highlighting how isolated these highly different beings are from each other in their own grief. “The Widowers” is a fantastic effort in publicly portraying a process many of us know is anything less than tidy but most of the country seems to think should be neatly packaged. Sadly, the filmmakers know this process all too well: The final credit in the film is a dedication to Roxane. She is the stillborn daughter of producer Katie Irish and director Jonathan Scott Chinn, delivered nearly two years ago, after most of the filming had been completed in the midst of late production and early editing. Chinn spoke to me about the eerie nature of being slammed by the most excruciating grief while actually making a film about grief, and how in the aftermath, having a lifelong passion project to cling to in their darkest moments was the nearly the only thing keeping them functional — besides each other. Irish and Chinn now have a five-month-old baby boy. Speaking of which, have we mentioned our love of Dia de los Muertos over here? It’s been an incredibly healing and creative practice through which to revisit awesome memories and feel close to the ones we love and lost (and also gives us an excuse to eat an abundance of their favorite foods, which, let’s be honest, was most likely not kale). Join in on some local celebrations in New York, Chicago, San Francisco, Los Angeles, and Las Vegas (man, this seems like a fun town for these), or in other places around the country. Or just have a meaningful time making up your own tradition. Interested in checking out “The Widowers”? Head to the Big Apple Film Festival in New York City on Saturday, Nov. 8 at 9 p.m. This is the last showing before its official release, details of which will be announced in a few weeks. Stay up to date by following “The Widowers” on Facebook or Twitter or sign up for the mailing list on the official website.